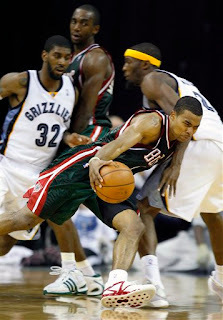 Bucks Drive Past Grizz ~ The Bucky Channel - The World of Sports from Wisconsin's Perspective. Ten games into the season, it's probably fair to say the Bucks aren't anywhere near they want to be as a team. They're still adapting to the new faces, including coach Scott Skiles. They've been without Michael Redd for about half of those games, and Charlie Villaneuva is a bit dinged up as well. But ten games into the season, I'm feeling pretty good about this Bucks team. Honestly, if you sat through and agonized during nearly every Bucks telecast last year, you are loving what is happening this season. The Bucks found themselves in a pretty big hole against the Grizzles last night, and last year's team may have not have had what it takes to come back. This year's team, however, was able to do just that. The Bucks fought and clawed their way back into this one, getting 20 points from one of their emerging stars in Ramon Sessions. Sessions had the game tying free throws with 42.3 second left to send the Bucks into overtime, where they won 101-96. The Bucks also got 26 points and 10 boards out of Richard Jefferson, 12 points and 15 board out of Andrew Bogut, 14 points out of Luke Ridnour, and playing time out of Austin Croshere. But the star of Friday night's game has to be the Cameroon prince, Luc Richard Mbah a Moute. This is a guy that was drafted for his defense in the 2nd round. It's a pick that probably isn't made if new Warriors assistant coach Larry Harris is still at the helm. Some thought Mbah a Moute might not even make the active roster, but he has turned into the Bucks best defensive player, and has started the last two games. Last night, he didn't disappoint, with 19 points and 17 rebounds. My buddy Gweeds and I have been joking about Mbah a Moute having the potential to win the NBA's scoring title. We even made up a back story about how he averaged 40 points per game in high school, and was forced to change his game at UCLA. It was in the pros, we said, where Mbah a Moute would revert to his old scoring ways. Granted, that's a little far fetched, but not only did he have 19 points on Friday, but he almost started as the two guard (aka shooting guard). If Charlie Bell wouldn't have been able to go, Malik Allen would have got the start and the Cameroon prince would have been inserted for bell. Mbah a Moute still delivered though, both on the floor and in the box score. Clearly, he is getting the night's honors for Bucky Channel Player of the Game. A second round pick that has become the team's best player. A big name trade for Richard Jefferson that hasn't disappointed. The bench players stepping up in the absence of Mikey Redd. And the philosophy of the coach reaching through the minds of the players. None of these things came close to happening last year, and that's what makes this season so exciting. These Bucks are Ready to Rise!